G Immanuel, C Bhagavath, P Iyappa Raj, P Esakkiraj, A Palavesam. Production and Partial Purification of Cellulase by Aspergillus niger and A. fumigatus Fermented in Coir waste and Sawdust. The Internet Journal of Microbiology. 2006 Volume 3 Number 1.
) 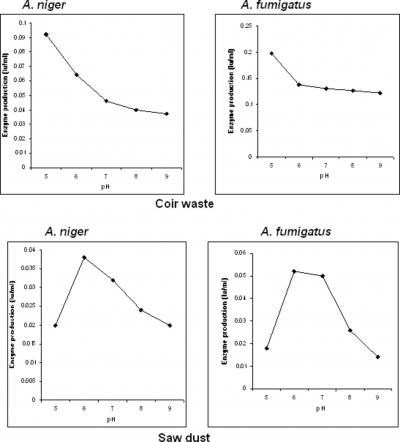 was recorded by A. fumigatus in coir waste and at the same time 50°C was optimum for maximum (0.274 IU ml-1) enzyme production by A. niger in saw dust waste. In FPA method, high level of enzyme production was obtained at pH7 by A. fumigatus (0.292 IU ml-1) and pH6 by A. niger (0.262 IU ml-1) when coir waste and saw dust used as substrates respectively. Similarly, at varying temperature, high level of enzyme production was obtained at 40°C by both organisms using both substrates. The partial purification of the cellulase enzyme revealed that, A. niger grown in coir waste supplemented medium had two protein bands with the molecular weight of 36 and 23kDa respectively, similarly A. fumigatus grown in the same medium also had two protein bands with molecular weight of 32 and 21kDa respectively. Cellulose is commonly degraded by an enzyme called cellulase. This enzyme is produced by several microorganisms, commonly by bacteria and fungi (Bahkali, 1996; Magnelli and Forchiassin, 1999; Shin et al., 2000; Immanuel et al., 2006). Although a large number of microorganisms are capable of degrading cellulose, only a few of these produce significant quantities of cell free enzymes capable of completely hydrolysing crystalline cellulose invitro. Fungi are the main cellulase producing microorganisms, though a few bacteria and actinomycetes have also been reported to yield cellulase activity. Fungal genera like Trichoderma and Aspergillus are taught to be cellulase producers and crude enzymes produced by these microorganisms are commercially available for agricultural use (Kazuhisa Miyamoto, 1997). In general, bacterial cellulases are constitutively produced, whereas fungal cellulase is produced only in the presence of cellulose (Suto and Tomito, 2001). Filamentous fungi particularly Aspergillus and Trichoderma spp. are well known efficient producers of cellulases (Peig et al., 1998). Several studies were carried out to produce cellulolytic enzymes from biowaste degradation process by many microorganisms including fungi such as Trichoderma, Penicillium, Aspergillus spp. etc. by Mandels and Reese (1985), Hoffman and Wood (1985), Brown et al. (1987), Lakshmikant and Mathur (1990) etc. Similarly celluloytic property of bacterial species like Pseudomonas, Cellulomonas, Bacillus, Micrococcus, Cellovibrio and Sporosphytophaga spp. were also reported (Nakamura and Kappamura, 1982; Immanuel et al., 2006). The specific cellulolytic activity shown by the bacterial species is found to be depending on the source of occurrence (Saxena et al., 1993). Some features of natural cllulosic materials are known to inhabit their degradation / bioconversion (Solomon et al., 1990 and 1999). These are degree of crystalinity, lignification and the capillary structure of cellulose to celluylolytic enzymes and other hydrolytic agents (Fan et al., 1987). However, many physical, chemical and microbial pre-treatment methods for enhancing bioconversion of cellulosic materials have been reported (Kumakura, 1997; Wu and Lee, 1997; Kanosh et al., 1999; Solomon et al., 1999). Since the production of cellulase enzyme is a major process and economically viable, much work has been done on the production of cellulase from lignocellulosics and major attention has been given to use baggase as substrate (Kanosh et al., 1999; Solomon et al., 1999). The bioconversion of various complex cellulosic waste materials such as baggase (Kanosh et al., 1999), corncob (Ojumu et al., 2003); saw dust (Solomon et al., 1999) have been reported. Likewise coir fibres are major biowaste discarded along with coir retting effluent to estuarine environment. Yet literature related to coir fibre as a carbohydrate source and cellulolytic activity by microorganisms involved in coir retting process is not studied properly. Hence, the present study was carried out to determine the cellulolytic enzyme activity of fungi, Aspergillus niger and A. fumigatus against coir waste and saw dust as carbohydrate source. The soil samples were aseptically collected from the coir retting ground of Rajakkamangalam retting zone area, Kanyakumari District, Tamil Nadu, India. The collected samples were sprinkled over the Czapek- Dox agar plates and were incubated for a period of 5 days at 30°C. The growth of fungal colonies was observed after incubation period. The individual colonies were isolated and restreaked on the same agar. Then the cultures were observed under the microscope to identify the specific species based on the following identification and characteristic features described by Sundarraj (2003). Based on the culture and morphological characteristics, two common fungal strains such as Aspergillus niger and A. fumigatus were identified. The cellulase activity was determined by streaking the identified fungal cultures individually on the carboxy methyl cellulase agar plates and was incubated at 30°C. After 5 days of growth, the zone was identified around the culture by treating the plate with Congo red and NaOH. Saw dust and coir dust are bio wastes and or abundantly available substrates. Both these substrates were aseptically collected from the respective industries. The raw substrates were sun dried individually to reduce the moisture content to make them more susceptible for crushing. The crushed substrates were then sieved individually to get powder form. Then the substrates were soaked individually in 1% sodium hydroxide solution (NaOH) in the ratio 1: 10 (substrate: solution) for two hours at room temperature. After which, they were washed for free of chemicals and autoclaved at 121°C for one hour. The treated substrates were then filtered and washed with distilled water until the wash water become neutral (Gharpuray et al., 1983; Solomon et al., 1999). The isolated cultures of A. niger and A. fumigatus were maintained as stock culture in Czapek- Dox agar slants. They were grown at 30°C for 5 days and stored at 4°C for regular sub culturing. 100 ml of inoculum was prepared for each culture using Czapek- Dox broth in 250 ml flasks. The inoculum was kept in shaker (200 rpm) at 35°C for 24 h before it was used for the fermentation process. To 100 ml of the optimised culture medium (Table 1), a piece of mycelia from respective species was inoculated under controlled conditions. Then it was kept in a shaker (200 rpm) at 35°C for a day (Solomon et al., 1999). Simultaneously, separate media were prepared for coir as well as saw dust substrates. The total amount of reducing sugars in 1.0 ml supernatant was determined by modified Dinitro salicylic method (DNS) of Miller (1972) and also Cellulase activity was determined by filter paper activity (FPA) method of Stephen et al. (2003). Filter paper activity is a combined assay for Endoglucanase (Cx) and Exoglucanase (Ci) cellulase. It is an alternative to Nelson-Somogyi method. It is simple sensitive and adoptable during handling of a large number of samples at a time. The culture filtrate was collected from the fermentation media by centrifugation. 1 ml of culture filtrate was taken in a test tube and it was equalised with 2ml of distilled water. To the prepared culture filtrate, 3 ml of DNS reagent was added. The contents in the test tubes were heated in a boiling water bath for 5 min. After heating, the contents were allowed to cool at room temperature. At the time of cooling, 7 ml of freshly prepared 40% sodium potassium tartarate solution was added. After cooling, the samples were read at 510 nm in a U.V. spectrophotometer (Techomp-2500). The amount of reducing sugar was determined using a standard graph. It is a combined assay for endo and exo β-1, 4 glucanase. The substrate used was Whatman No. 1 filter paper. 2 ml of crystalline cellulose solution was taken in a test tube [filter paper – (50 mg) and dissolved in 0.2 M sodium acetate buffer (pH 5.5)]. To this tube, 0.5 ml of the culture filtrate was added (enzyme solution). The mixture was incubated at 35°C for one hour and the reaction was terminated by adding 2 ml of DNS reagent. Then it was heated in a boiling water bath for 5 min and then 1 ml of potassium sodium tartarate (40%) was added to the warm tubes. The tubes were allowed to cool and the absorbance was read at 540 nm in a U.V. spectrophotometer. The enzyme production was expressed as the mg glucose released per minute per mg of protein. The optimised media were prepared using the individual substrates and the pH was set at different level such as 5, 6, 7, 8 and 9 respectively by adding 1% NaOH and concentrated HCl. Then the media were autoclaved. Later they were inoculated with a piece of mycelia and were placed in a shaker (150 rpm) at 30°C for 5 days. Simultaneously, for both the organisms and both the substrates, assay was carried out separately. The optimised media were prepared individually by using the substrates and autoclaved. Later it was inoculated with a piece of mycelia and was set at different temperatures 20, 30, 40 and 50°C respectively. The effect of temperature on the production of cellulolytic enzyme was determined by growing the organisms at the above temperatures. Simultaneously for both the organisms and both the substrates, separate assay was carried out. The enzyme solution obtained from these two (pH and temperature) experiments was individually optimised based on Dinitro-salicyclic acid and filter paper activity methods as described earlier. The fungal organisms A. niger and A. fumigatus were grown in optimised media (100 ml of individual carbon source) at 30°C for 24 h individually. Then after growth, the culture filtrates were collected separately by centrifugation process. 100 ml of crude enzyme (it is the culture filtrate of the respective organisms grown individually) from each source (both organisms and substrates) were taken individually and along with that 500 ml each of ethyl alcohol was added. They were allowed for precipitation for an hour and then centrifuged at 5000 rpm for 10 min. The precipitated enzymes from each source were refrigerated (4°C) until further analysis. The precipitate collected from each source was dissolved individually in 30 ml of sodium acetate buffer (0.2 M) at pH 5.5 and were dialyzed against the same buffer overnight at 4°C. The dialysed enzyme samples from each source was analysed through PAGE using specific standard molecular marker. The gel obtained was photographed and scanned using a gel documentation system (SYNGENE, UK). Then the molecular weight of individual enzyme fractions was determined by referring the molecular weight of the marker. The results obtained in the present study were subjected to SD and One-Way ANOVA described by Zar (1974). The cellulose enzyme production by A. niger in varying pH using coir waste as substrate showed maximum at pH 5 (0.092 ± 0.003 IU ml-1) and it was optimum, further when the pH level increased, the enzyme production was reduced, i.e. 0.064 ± 0.002 to 0.037 ± 0.004 IU ml-1 from pH 6–9 respectively (Fig. 1). The statistical analysis carried out by one-way ANOVA for the enzyme production at varying pH was statistically more significant (P < 0.0001). When A. fumigatus grown in the medium supplemented with coir waste as major carbon source revealed that the enzyme production was more (0.198 ± 0.003 IU ml-1) at lower pH (pH 5), subsequently, when the pH increased from 6 to 9, the enzyme production was reduced further (0.138 ± 0.001 to 0.122 ± 0.003 IU ml-1) respectively (Fig. 1). The variation among the pH level in enzyme production was statistically more significant (P < 0.0001). When A. niger grown in saw dust supplemented growth medium, it produced 0.020 ± 0.002 IU ml-1 cellulase enzyme at pH 5. But at pH 6, it produced 0.038 ± 0.004 IU ml-1 enzyme and it was the optimum, further when the pH level increased, the amount of enzyme production was significantly (P<0.0001) decreased. The cellulase enzyme production by A. fumigatus when grown in culture medium supplemented with saw dust showed a maximum at pH 6 (0.052 ± 0.002 IU ml-1). Whereas, it was 0.018 ± 0.003 IU ml-1 at pH 5 and 0.050 ± 0.005, 0.026 ± 0.002 and 0.014 ± 0.002 IU ml-1 between pH 7 and 9 respectively (Fig. 1). The cellulase enzyme production by FPA method determined that A. niger grown at coir waste as major carbon source in the growth medium showed an optimum production at pH 7 (0.288 ± 0.004 IU ml-1), whereas at either sides, it was 0.120 ± 0.003, 0.177 ± 0.002, 0.254 ± 0.003 and 0.196 ± 0.003 at pH 5 to 6 and 8 to 9 respectively. The enzyme production by A. fumigatus by this method showed maximum production at pH 7 (0.340 ± 0.003 IU ml-1). Then it significantly (P<0.0001) decreased to 0.268 ± 0.004 and 0.243 ± 0.003 IU ml-1 at pH 8 and 9 respectively (Fig. 2). The results revealed that the enzyme production by A. niger was less at 20°C (0.186 ± 0.004 IU ml-1), it increased to 0.192 ± 0.003 IU ml-1 at 30°C and it reached a maximum of 0.258 ± 0.003 IU ml-1 at 40°C. This is the optimum temperature and further the temperature increased, the enzyme production was significantly (P<0.0001) decreased (0.241 ± 0.002 IU ml-1) at 50°C. The maximum amount of enzyme production (0.292 ± 0.005 IU ml-1) was observed at 40°C by A. fumigatus. At either sides of temperature, it was 0.146 ± 0.003, 0.190 ± 0.003 and 0.203 ± 0.004 IU ml-1 at 20, 30 and 50°C respectively (Fig.3). The enzyme production by A. niger was less at 20°C (0.162 ± 0.002 IU ml-1), further it increased to 0.170 ± 0.005 and 0.204 ± 0.002 IU ml-1 at 30 and 40°C respectively. Finally it reached to a maximum at 50°C (0.274 ± 0.003 IU ml-1). The maximum amount of enzyme production (0.272 ± 0.003 IU ml-1) was recorded at 50°C by A. fumigatus. From the temperature 20 to 40°C, it was 0.156 ± 0.003, 0.184 ± 0.002 and 0.206 ± 0.003 IU ml-1 respectively (Fig. 3). At 20°C, the enzyme production by A. niger was 0.290 ± 0.005 IU ml-1 and it increased to 0.298 ± 0.005 IU ml-1 at 30°C. At 40°C, it reached its maximum of 0.338 ± 0.003 IU ml-1 and subsequently, the enzyme production was reduced to 0.304 ± 0.002 IUml-1 at 50°C. The maximum enzyme production (0.339 ± 0.003 IU ml-1) by A. fumigatus was observed at 40°C. But at 20 to 30°C, it was 0.270 ± 0.002 to 0.291 ± 0.003 IU ml-1 and at 50°C, the enzyme production was 0.314 ± 0.004 IU ml-1 (Fig. 4). The fungal strain A. niger, when grown in the growth medium supplemented with saw dust as substrate showed the maximum production of enzyme (0.340 ± 0.002 IU ml-1) at 40°C, whereas at the temperature 20, 30 and 50°C, the enzyme production was at the rate of 0.271 ± 0.004, 0.328 ± 0.005 and 0.318 ± 0.004 IU ml-1 respectively. A. fumigatus also showed maximum cellulase enzyme production at 40°C (0.334 ± 0.002 IU ml-1). At either sides of temperature, the enzyme production was 0.271 ± 0.003, 0.312 ± 0.002 and 0.302 ± 0.003 IU ml-1 at 20, 30 and 50°C respectively (Fig. 4). Fig. (5) represents the protein profile of cellulase produced by A. niger and A. fumigatus using coir waste and saw dust as substrates. The protein fractions were determined by densitometric scanning. The relative mobility's of protein fractions in Rf value and corresponding molecular weight of each sample was determined. The protein fractions have been assigned numbers in order of the increasing mobility towards the anode. In case of A. fumigatus grown on coir waste, two protein bands were obtained each containing molecular weight of 32 and 21 kDa respectively. While, A. niger grown on the same substrate also showed two bands having molecular weight of 36 and 23 kDa respectively. In case of saw dust used as substrate, A. niger showed two bands with molecular weight of 22 kDa and 20 kDa respectively, while A. fumigatus showed two bands with molecular weight of 20 kDa and 17 kDa respectively. On comparing the enzyme production by both strains grown at two different substrate supplemented medium, coir waste showed maximum enzyme production by both organisms than that of saw dust. Comparison between the fungal strains showed A. niger produces more enzyme than A. fumigatus on the two carbon sources. Major impediments to exploit the commercial potential of cellulases are the yield stability and cost of cellulase production. Therefore, research should also aim at exploiting the commercial potential of existing and new cellulase in nature (Coral et al., 2002). Agricultural residues such as corn stove, wheat straw, rice straw, baggase etc. were used in cellulase production (Rao et al., 1983; Chalal, 1996). Although, the raw materials are cheaper, pre-treatment is generally required to improve the utilizability of lignocellulosic materials and the cost is considerable (Liming Xia and Peilin Cen., 1999). In view of the above facts, in the present study, the natural waste materials such as coir waste as well as saw dust waste have effectively utilized as major carbon source for the production of cellulase enzyme by fungal strains. A capacity to degrade cellulose is a character distributed among a wide variety of aerobic, facultative aerobic, anaerobic bacteria and fungi. The characters are restricted to a few species among several major taxa (Gooday, 1979). The important cellulolytic fungus like Trichoderma sp. (Wood and Mc Care, 1972; Shaw and Quejesky, 1979; Mandels and Reese, 1985); Penicillium Sp. (Hoffman and Wood, 1985; Brown et al., 1987); Sporotrichium Sp (Erikkson and Johnsrud, 1983); Aspergillus sp (Kazuhisa Miyamoto, 1997) etc have been reported to have cellulolytic activity. In the present study, two fungal strains such as Aspergillus niger and A. fumigatus were isolated from the coir retting soil samples and selected as the major cellulytic fungal strains for cellulase enzyme production. The natural sources of cellulose degradation are varied and these may be investigated by several investigators. For eg. termits are the best cellulase degrader in soil from the tropic to desert, they stir and mix with the aid of bacteria, protozoa and fungi, thereby they effectively recycle cellulose. The degradation activity of termites is by microbes present in their intestine (Saxena et al., 1993), by mushroom eg. Lentinula edodes etc. (Jose Antonio et al., 2003). The carbon sources induce production of cellulase, but amount produced is variable. This is because of the influence of substrate (carbon source) on the growth of cellulolytic organisms (Mandels and Reese, 1985; Zhu et al., 1988; Lakshmikant and Mathur, 1990). In the present study, two different substrates such as saw dust and coir wastes were used as major carbon source. Apart from this, some environmental factors are also influenced the growth of organisms as well as maximum production of enzymes will be at certain optimum temperature, pH, salt concentration etc. (Immanuel et al., 2006). In the present study, the effect on environmental factors such as pH and temperature against A. niger and A. fumigatus were analysed. The optimum temperature of cellulase enzyme was found to be around 40°C. This value is lower than that of commercial cellulase production (60°C) (Deerlands co-operation). On the other hand, endoglucanase from A. niger was reported to be stable at 50°C and the enzyme showed major peaks at pH 4.5 and 7.5. The result is probably due to the presence of two isoenzymes or subunits in enzyme preparation. It was reported that optimal pH for CMCase from A. niger was found to be 6.0 to 7.0 (Parry et al., 1983). But Akiba et al. (1995) reported that the production was high at pH 4 and 4.5 by A. niger. In the present study, the ability of cellulase degrading fungi, A. niger and A. fumigatus on saw dust and coir waste substrates were performed in various pH using Dinitrosalicylic acid method and filter paper activity method. The results showed that in DNS method, cellulase enzyme production by both organisms was maximum (0.092 and 0.198 IU ml-1) at pH 5 with coir waste as substrate. While in saw dust used as carbon source, high level of production was found at pH 6 by both organisms (0.052 IU ml-1 by A. fumigatus and 0.038 IU ml-1 by A. niger). In the filter paper assay method by using coir waste as substrate, high level of enzyme production was obtained at pH 7 (0.340 IU ml-1 by A. fumigatus and 0.288 IU ml-1 by A. niger). While in sawdust used as substrate, high level of production was obtained at pH 6 (0.264 IU ml-1 by A. fumigatus and 0.262 IU ml-1 by A. niger). 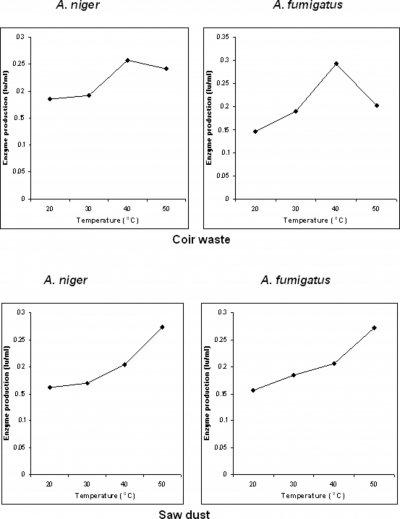 Regarding the temperature influence on production of enzymes, the DNS method by using coir waste as substrate showed that high level of production was obtained at 40°C. i.e., 0.292 and 0.258 IU ml-1 by A. fumigatus and A. niger respectively. But in the case of saw dust used as substrate, high level of production was found at the temperature 50°C. In filter paper assay method, when coir waste used as substrate, high level of enzyme production was obtained at 40°C (A. fumigatus - 0.033 IU ml-1 and A. niger -0.338 IU ml-1). Similar trend was obtained when sawdust used as substrate by both organisms. For estimation of optimum temperature of enzyme, the enzyme activity was determined by carrying out the assay at several temperatures between 30 and 90°C. The optimum temperature was observed around 40°C (Coral et al., 2002). Here in the present study, it is evident that 40°C is optimum for the production of cellulase enzyme when coir waste used as major carbon source. While in case of saw dust used as carbon source, the temperature ranged from 40 – 50°C for optimum production of cellulase enzyme. In case of pH, it was observed that the enzyme activity has a broad pH range between 3.0 and 9.0 (Coral et al., 2002). 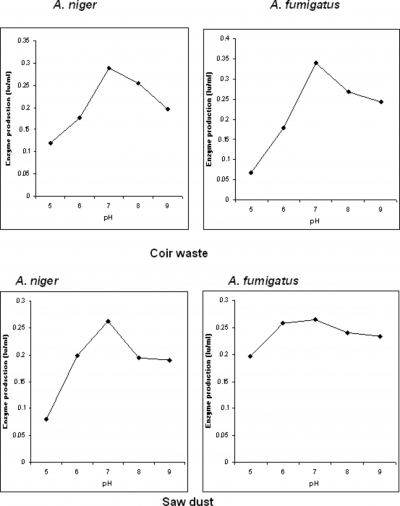 Here in the present study, it was found that pH 5 – 7 is optimum in case of coir waste as substrate, but pH 6 is optimum when sawdust used as substrate for enzyme production by A. niger and A. fumigatus. Thus it was seen that there were no arrangements regarding enzyme data results. Such different results may appear because of differences within the same genus. In addition, no comparative investigations have been published on the enzymes from these organisms but the difference appears to be small as difference in morphology between the species (Aunstrup et al., 1979). But pH requirement was determined at pH 5.0 in fungal species Trichoderma harizianum (Sidhu and Shadhu, 1984), Fusarium avenaceum (Forbes and Dikinson, 1977) etc. A cellulytic enzyme from A. niger was separated as a homogenous entity in SDS-PAGE with molecular weight of 83,000 and 50,000 respectively. In over producers of CMCase, three bands showing cellulolytic activity were detected on gel during electrophoresis of the crude enzyme. The molecular weights of these bands were estimated to be 18.5, 23 and 28 kDa. These bands (proteins) may be isoenzymes or the different subunits of the same enzyme protein on electrophoresis gel (Coral et al., 2002). 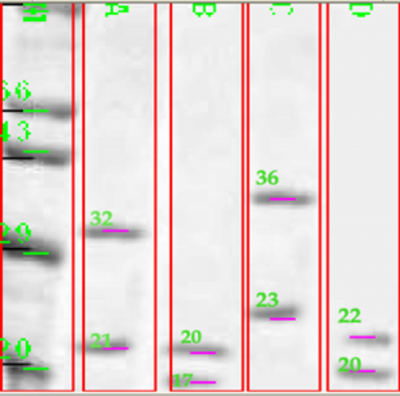 In the present study with SDS-polyacrylamide gel electrophoresis two bands showing cellulolytic production were detected in each lane from the crude enzyme. The molecular weight was 32 kDa and 21 kDa in case of A. fumigatus on coir waste, while on saw dust used as substrate it had two protein bands of 20 and 17 kDa respectively. A. niger, with that of coir substrate, the molecular weight of the identified two bands was 36 and 23 kDa respectively, but on saw dust used as substrate, it had two bands with 22 and 20 kDa respectively. 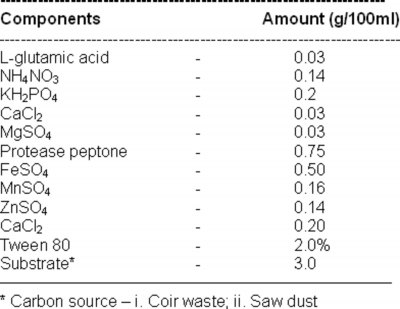 From this study, it is evident that the coir waste is the best carbon source for the production of cellulase than saw dust. Likewise coir and sawdust are suitable lignocellulosic bio wastes for the production of cellulase enzyme. From the present study, it could understand that sawdust is most suitable substrate for cellulase production when compared to that of baggase or corncob (Ojumu et al., 2003) as it gives highest yield of enzyme. The coir waste is most abundant lignocellulosic waste obtained in Kanyakumari district, Tamil Nadu, India, can be effectively used for cellulase production and it is concluded that it has high ability to produce cellulase enzyme. Cellulase enzyme production accounts for 40% of cost in bioethanol synthesis. To reduce cost of production, the lignocellulosic substrates are used instead of synthetic cellulase due to their reasonable cost, high enzyme production capacity etc. The reduction in cost paves an economically easy way production of ethanol. It is an important issue to deal with the residue both the comprehensive utilization of lignocellulosic resources and for the prevention of environmental pollution. r-0. Anustrup K (1979). Production, isolation and economics of extracellular enzymes. Appl. Biochem. Bioeng., 2 : Enzyme Technology, Ed. By Wingard, Jr. L. B. Katchalski – Katzir, Golstein, L. Academic Press, New York, San Francisco, London. r-1. Akiba S, Kimura Y, Yamamoto K, Kumagap H (1995) Purification and characterization of a protease-resistant cellulase from Aspergillus niger. J. Fermen. Bioengin. 79: 125-132.
r-2. Bahkali A H (1996) Influence of various carbohydrates on xylanase production by V. tricorpus. Bioresource Technol. 33(3): 265 – 268.
r-3. Brown JA, Collin AA, Wood TM (1987) Development of a medium for high cellulase, xylanase and β-glucosidase production by a mutant strain (NTG1116) of cellulolytic fungus Penicillium pinophilium. Enzyme and Microbial. Tech. 5: 425 – 429.
r-4. Chalal P S, Chalal DS, Le GBB (1996) Production of cellulase in solid state fermentation of Trichoderma reesei. MCG80 on wheat straw. Appl. Biochem. Biotechnol. 57/58, 433 – 42.
r-5. Coral G, Arikan B, Unaldi MN, Guvenmens H (2002) Some properties of crude carboxymethyl cellulase of Aspergillus niger Zio. Wild type strain. Turk. J. Biol. 26: 209 – 213.
r-6. Eriksson K K, Johnsrud SC (1983) Mutants of white – rot fungus Sporotrichum pulverulentum with increased cellulase and β-glucosidase production. Enzyme and Microbial. Technol. 38: 425 – 429.
r-7. Fan LT, Gharpuray MM, Lee YH (1987) Cellulose hydrolysis, Berlin, Germany, Springer-Verlag, 3: 1 – 68.
r-8. Forbes RS, Dickinson CH (1977) Effect of temperature, pH and nitrogen on cellulolytic activity of Fusarium avenaceum. Trans. Br. Mycol. Soc.68: 229 – 235.
r-9. Gharpuray MM, Lee YH, Fan LT (1983) Structural modification of lignocellulosic by treatment to enhance enzymatic hydrolysis. Biotechnol. 25: 157 – 170.
r-10. Gooday GM (1979) A survey of polysaccharides production: a search for phylogenetic implications. In : Microbial polysaccharides and polysaccharases, Eds. Berkeley, R. C. S., Gooday, G. W. and Ellwood, D. C., pp. 437 – 460. Condon, Academic Press. r-11. Hoffman RM, Wood TM (1985) Isolation and partial characterization of a mutant Penicillium for the saccharification of straw. Biotechnol. Bioeng. 27: 81 – 85.
r-12. Immanuel G, Dhanusa R, Prema P, Palavesam A (2006) Effect of different growth parameters on endoglucanase enzyme activity by bacteria isolated from coir retting effluents of estuarine environment. Int. J. Environ.Sci.Tech. 3 (1): 25-34.
r-14. Kanosh AL, Essant SA, Zeinat AM (1999) Biodegradation and utilization of baggase with Trichoderma ressei. Polym. Degrad. Stab. 62: 273 – 276.
r-15. Kazuhisa Miyamoto (1997) Renewable biological system for alternative sustainable energy production (FAO-Agricultural Services Bulletin, 128), Osaka University, Osaka, Japan. r-16. Kumakura M (1997) Preparation of immobilized cellulase bonds and their application to hydrolysis of cellulosic materials. Process. Biochem.325: 555 – 559.
r-17. Lakshmikant K, Mathur SN (1990) Cellulolytic activities of Chaetomium globosum on different cellulosic substrates. World. J. Microbiol. Biotechnol. 11: 23 – 26.
r-18. Liming Xia Peilin Cen (1999) Production by solid state fermentation on lignocellulosic waste from the xylose industry. Process. Biochem. 34: 909 – 912.
r-19. Mandels M, Reese ET (1985) Fungal cellulase and microbial decomposition of cellulosic fibres. Dev. Ind. Microbiol. 5: 5 – 20.
r-20. Mangelli P, Forchiassin F (1999) Regulation of the cellulase complex production by Saccobolus saccaboloides, induction and repression by carbohydrates. Mycologia. 91(2): 359 – 364.
r-21. Miller GL (1972) Use of dinitrosalicyclic acid reagent for determination of reducing sugar. Biotechnol. Bioeng. Symp. 5: 193 - 219.
r-22. Nakamura K, Kppamura K (1982) Isolation and identification of crystalline cellulose hydrolyzing bacterium and its enzymatic properties. J. Ferment. Technol. 60 (4): 343 - 348.
r-23. Ojumu T, Solomon V, Bamidele O, Betiku E, Layokun SK, Amigun B (2003) Cellulase production by Aspergillus flavus Linn Isolate NSPR 101 fermented in sawdust, bagasse and corncob. African J. Biotechnol. 2 (6): 150–152. r-24. Parry JB, Stewart JC, Heptinstall J (1983) Purification on the major endoglucanase from Aspergillus fumigatus frecius. Biochem. J. 2131: 437 – 444.
r-25. Peij N, Gielkens MMC, Verles RP, Visser K, Graff LH (1998) The transcriptional activator XinR regulates both xylanolytic endoglucanase gene expression in Aspergillus niger. Appl. Environ. Microbial. 64(10): 3615 – 3617.
r-26. Rao MNA, Mithal BM, Thakkur RN, Sastry KSM (1983) Solid state fermentation for cellulase production by Pestalotiopsis versicolor. Biotech. Bioeng. 25: 869 – 872.
r-27. Saxena S, Bahadur J, Varma A (1993) Cellulose and hemicellulose degradation bacteria from termite gut and mound soils of India. Int. J. Microbiol. 33(1):55– 60.
r-28. Shaw TV, Quejesky H (1979) Characterization of the growth and cellulolytic activities of Trichoderma viride. Develop. Indust. Microbiol. 12: 212 – 224.
r-29. Shin CS, Lee JP, Lee IS, Park SC (2000) Enzyme production of Trichoderma ressei. Rut C-30 on various lignocellulosic substrates. Appl. Biochem. Biotech. 84 – 86(1-9): 237 – 245.
r-30. Sidhu SM, Sandhu DK (1984) Production and localization of β-glucosidase in Trichoderma harzianum and some aspects of catbolite repression. Can. J. Microbiol. 30: 1377 – 1382.
r-31. Solomon BO, Layokun SK, Nwesigwe PK, Olutiolo PO (1990) Hydrolysis of saw dust by cellulase enzyme derived from Aspergillus flavus Linn. Isolates NSPR 101 beyond the initial fast rate period. JNSCHE. 9: 1 – 2.
r-32. Solomon BO, Amigun B, Betikue TV, Ojumu T, Layokun SK (1999) Optimization of cellulase production by Aspergillus flavus Linn. isolates NSPR 101 grown on baggase. JNSCHE. 18: 61 – 68.
r-33. Stephen RD, William SA, Edward J, Todd BV, Michael EH (2003) Automated Filter paper assay for determination of cellulose activity. Appl. Biochem. Biotech. 108: 689-703.
r-34. Suto M, Tomito F (2001) Induction and catabolite repression mechanisms of cellulase in fungi. J. Biosci. Bioengg. 92(4): 305 – 311.
r-35. Wood TM, Mc Care SL (1972) The purification and properties of the C1 component of Trichoderma koningii cellulase. Biochem. J. 128: 1183 – 1192.
r-36. Wu Z, Lee YY (1997) Inhibition of the enzymatic hydrolysis of cellulose by ethanol. Biotechnol. Lett. 19: 977 – 979.
r-37. Zhu YS, Gao H, Fei JX, Sum CN (1988) Induction and regulation of cellulase synthesis in Trichoderma mutant EA3 – 867 and N2 – 78. Enzyme of Microbiol. Technol. 4: 3 – 12.
r-38. Zar J H (1974) Biostatistical Analysis. Prentice Hall, New Jersey, pp. 620. C. M. Akila Bhagavath, M. Phil. P. Iyappa Raj, M. Phil.